House prices have risen most in smaller cities during the past 10 years, the UK's biggest mortgage lender has said. The Halifax figures were based on cost per square metre of floor space. 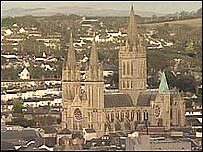 Truro in Cornwall came top of the list, with the average price of a house leaping by 262% from just £518 per square metre in 1996 to £1,876. Aberdeen had the slowest growth, London was the most expensive per square metre and Armagh, in Northern Ireland, was the least expensive city. The Halifax said the cost of property measured in this way had tripled since 1996 in 15 of the cities surveyed and had at least doubled in all of the 62 cities it looked at. Brighton in Sussex saw the second biggest jump with prices per square metre rising by 260%, followed by Salford in Greater Manchester at 255%, London at 252% and Bath at 236%. Most of the cities with the highest increases are in southern England, with Scottish cities such as Stirling and Glasgow at the other end of the scale with the smallest increases. The price gap between London and other UK cities has widened during the past decade. In 1996 the price of property per square metre in London was only 0.3% higher than the second most expensive city of St Albans and 172% higher than the least expensive city of Armagh. But today's prices show London is 31% higher than St Albans and 255% more than in the least expensive one. Martin Ellis, chief economist at Halifax Estate Agents, said: "Smaller cities, with an average population of less than 250,000, like Truro, Brighton and Bath have generally recorded the largest increases. "This highlights that many households want the conveniences of city living, such as good shopping, transport links and easy commuting whilst living in attractive surroundings." Mr Ellis said using the square metre system helped to compare differences in the size and type of properties between locations.